VERMILLION, S.D. – Through funding from the American Recovery and Reinvestment Act of 2009, the University of South Dakota’s A.S.N. 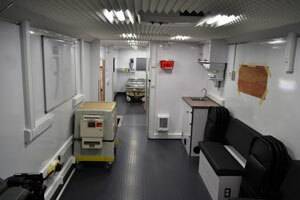 Distance Nursing Program has unveiled a mobile simulation unit (MSU) featuring cutting-edge technology. The MSU, which weighs approximately 25,000 lbs. and is 38-feet long, will be utilized for the first time on Wednesday, Jan. 25, in Waconia, Minn.
“Simulation provides nursing students a way to practice dealing with critical situations before dealing with real patients,” stated faculty member Barbara Stolle, R.N., M.S. The MSU resembles mobile medical clinics or mobile diagnostic units, and will be used to provide students in the distance-learning program the opportunity to learn and practice nursing care skills and participate in patient care simulations. In addition to containing all of the technology used in a smart classroom and state-of-the-art equipment found in any modern simulation unit, including mannequins that talk, cough, produce heartbeats and breathe, the MSU also features video recording devices and a flat screen viewing monitor in a multi-purpose debriefing area resembling a waiting room. The recording and viewing equipment allows students an opportunity to view a live feed of the simulation or review recordings to examine their performance and enhance learning. 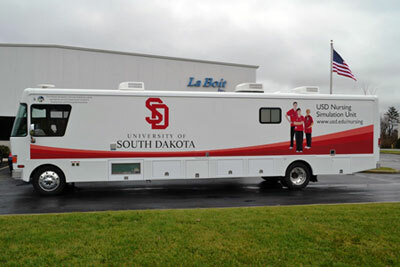 Besides serving students in primarily rural communities throughout the nine states where nursing students participate in clinical training through the USD A.S.N. Distance Nursing Program, usage of the MSU will be extended to partners of the distance nursing program: new graduate hires, incumbent staff RN cross-training, nurses pursuing competency validation and individuals involved in career advancement in high-risk nursing areas. Built by LaBoit Inc. out of Columbus, Ohio, which specializes in customized mobile vehicles that serve the medical, law enforcement, veterinary and emergency command fields, the MSU is entirely funded by a portion of a $5 million grant from the Employment and Training Administrative/Department of Labor that was awarded to USD Nursing on March 1, 2010. Most of these grant funds will go toward recruitment efforts of unemployed veterans and military personnel with an interest in obtaining entry-level health care positions and completing the online USD A.S.N. Distance Nursing Program. Funds will also assist future nurse educators completing graduate degrees. Founded in 1862, The University of South Dakota is designated as the only public liberal arts university in the state and is home to a comprehensive College of Arts and Sciences, School of Education, School of Health Sciences, the state’s only School of Law, School of Medicine, the accredited Beacom School of Business and the College of Fine Arts. It has an enrollment of more than 9,900 students taught by 400 faculty members. More information is available at www.usd.edu/press/news.